A 'why-didn't-I-think-of-that' tool for quick assembly of miniature components. 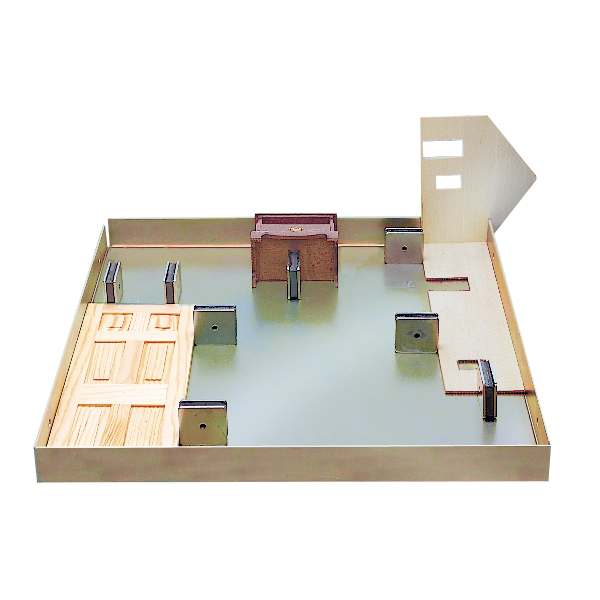 Use for dollhouse furniture, miniature picture frames, model railroad structures and rolling stock, ship model deck houses and more. 10-1/4 inch x 10-1/4 inch, 21 gauge steel plate with 7/8 inch flanges bent up at 90 degrees. Includes 8 magnetic holding plates that keep components together squarely while glue dries. Make perfectly aligned wood joints! Really works well. Held balsa window moulding for my dollhouse perfectly aligned. Put wax paper under pieces to be glued so they don’t stick to the jig.